In a move aimed at stimulating the growth of new mapping applications, Real Earth (http://realearth.us) has partnered with Velodyne LiDAR to lower the cost of entry for creation of high quality LiDAR-sourced maps – without reliance on GPS. As part of the collaboration, Real Earth will offer users free access to its web-based software, which processes Velodyne LiDAR data and converts it into maps. Because costly GPS and inertial navigation systems are not required, these next-generation maps are significantly more affordable than those developed with standard mapping systems. Real Earth’s web-based service (http://realearth.us/mapmaker) enables users to upload laser scans and receive dense 3D reconstructions in return. Standard CAD tools can then view and manipulate the registered point clouds. The Real Earth/Velodyne collaboration supports all three models of Velodyne’s high-definition, real-time 3D LiDAR (Light Detection and Ranging) sensors – the original 64-channel HDL-64E, the popular 32-channel HDL-32E, and the newest, cost-competitive model, the 16-channel VLP-16 LiDAR Puck. For applications where the sensors are moving rapidly, Real Earth’s algorithms take advantage of the information from the HDL-32E’s IMU (Inertial Moment Unit), adding another layer of robustness. Real Earth develops software for 3D laser scan registration and real-time position estimation that can be deployed on hand-held, ground vehicle, or aerial platforms. The real-time software is simple to use— sensors and systems can be standalone, without requiring synchronization of external GPS receivers and IMUs and thereby require little integration effort. Velodyne is recognized worldwide as the standard for LiDAR sensors for autonomous vehicle applications, having created enabling technology for the industry. Velodyne introduced multi-channel, real-time 3D LiDAR during the 2004-2005 DARPA Grand Challenge and has since optimized the technology for a range of other applications, from unmanned aerial vehicles and mobile mapping to robotics and factory automation. 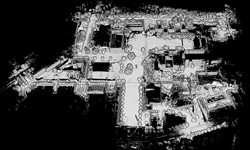 Users can log laser scans using Velodyne’s open-source VeloView software, Real Earth’s drivers from their web site, or other open-source drivers, including those from Robotic Operation System (http://www.ros.org) or the HDL-Grabber by PointCloudLibrary (http://www.openperception.org). Up to 1 GB of Velodyne LiDAR data can be uploaded via a web interface for free, and registered point clouds are available and accessible anywhere within a few hours via a link emailed to the user. Real Earth plans to license its software to produce maps for larger volume customers or to provide real-time pose estimates for robotic guidance and navigation. Real Earth is a Pittsburgh based company commercializing software for rapid 3D reconstruction using laser scanners. Real Earth is creating software tools to address the mapping needs of several industries: architecture, real estate, insurance, mining and agriculture. In addition, Real Earth software can be used to estimate accurate 6-DOF motion without need for retrofitting the environment. For the latest information on new products, and services, please visit http://www.realearth.us or email info@realearth.us.